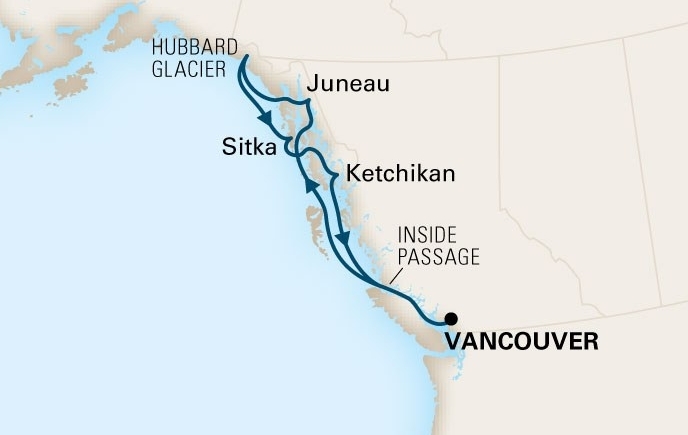 Experience the most dramatic assemblage of actively calving glaciers in North America with our Inside Passage cruise itinerary, departing Vancouver B.C. on Saturdays and Wednesdays. Journey through the forested islands and majestic mountain ranges of the Inside Passage from Vancouver to Skagway on this classic Alaska cruise vacation. Dine on fresh salmon and Alaska King Crab legs. Treasure the rare experience of getting close to massive glaciers in Glacier Bay National Park. Step back in time to the Klondike gold rush on the antique White Pass & Yukon narrow-gauge railway in Skagway. Explore native culture and Tongass National Forest in Ketchikan. Search for bears and whales or go glacier hiking on an adventure tour in Juneau. Departing Sundays, northbound from Vancouver, B.C. 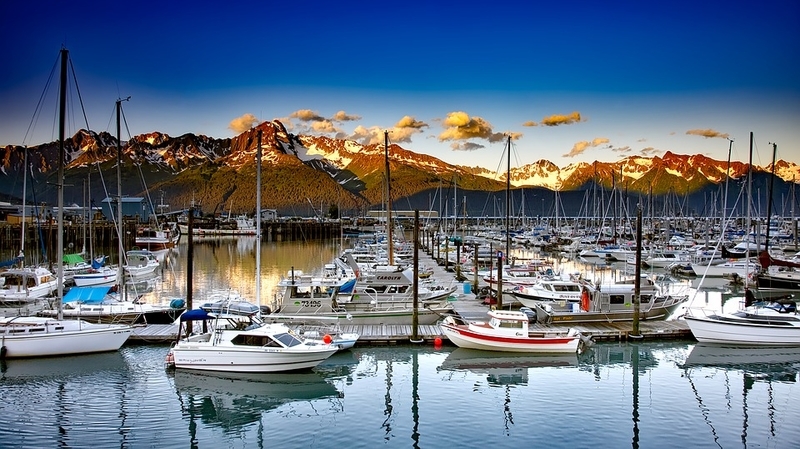 and southbound from Seward (Anchorage), this marquee itinerary has twice the ice plus premiere Inside Passage ports to showcase wildlife, native culture and gold rush history. In Glacier Bay National Park listen for the loud, deep rumble and wait for the mighty crack and thunderous crash – at any moment you may witness an eternal drama as nature hand sculpts icebergs before your wondering eyes. Shoreside, experience the rich living culture of Southeast Alaska Natives in Ketchikan, walk in the footsteps of Klondike gold rush prospectors in Skagway, take a dogsled adventure in Juneau and look for whales, sea lions and otters in Kenai Fjords National Park. FOUR POINTS BY SHERATON AIRPORT SOUTH Enjoy your stay at the Four Points by Sheraton Seattle Airport South. Check-in is available after 3:00 pm. Baggage-handling gratuities and taxes are included. Note: Triple and quad rooms, when available, may consist of two double beds, and may not be suitable for three adults. If you require separate beds, we suggest that you pre-purchase an additional room. Special requests such as king or double beds, etc., are at the discretion of the hotel and cannot be guaranteed. Guests are responsible for incidentals and meals unless noted otherwise. FAIRMONT OLYMPIC HOTEL Among the premier luxury Seattle hotels, The Fairmont Olympic boasts impeccable service, splendid Italian Renaissance architecture and two award-winning restaurants. SHERATON SEATTLE HOTEL The Sheraton provides a gateway to the diverse sights and sounds of the Pacific Northwest, as well as a quiet, elegant retreat in luxurious comfort. Enjoy superb service and an array of superior amenities, and step out the front doors to find gourmet food, exciting entertainment and world-class shopping. HILTON SEATTLE AIRPORT (Airport) The Hilton Seattle Airport provides convenient location plus complimentary airport shuttle service. 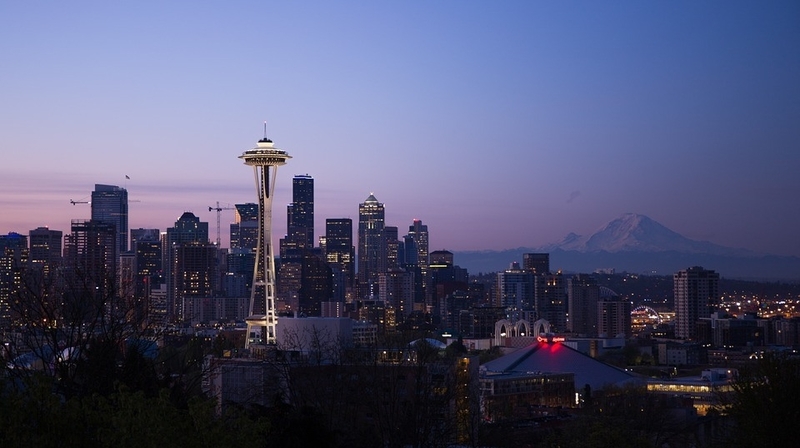 The hotel’s proximity to the Seattle Light Rail network makes it easy to get around, and the comforts of your spacious room provides all the comforts of home. SHERATON SEATTLE (Downtown) The Sheraton provides a gateway to the diverse sights and sounds of the Pacific Northwest, as well as a quiet, elegant retreat in luxurious comfort. Enjoy superb service and an array of superior amenities, and step out the front doors to find gourmet food, exciting entertainment and world-class shopping. FAIRMONT OLYMPIC HOTEL (Deluxe) Among the premier luxury Seattle hotels, The Fairmont Olympic boasts impeccable service, splendid Italian Renaissance architecture and two award-winning restaurants. WESTMARK ANCHORAGE HOTEL (Downtown) Perfectly located in the heart of downtown Anchorage, the Westmark Anchorage Hotel is a blend of sophistication and convenience. With a restaurant, lounge, and over-sized guestrooms, the hotel offers supreme comfort in Alaska’s largest city. This hotel is available with either motorcoach or Cruisetrain transportation to Seward. HILTON ANCHORAGE (Downtown) The Hilton Anchorage hotel is ideally located within walking distance of Alaska’s premier attractions. Discover the best shopping, dining, and cultural activities Alaska has to offer within minutes of leaving the hotel. This hotel is available with either motorcoach or Cruisetrain transportation to Seward. FOUR SEASONS HOTEL VANCOUVER Rising above Pacific Centre, Four Seasons Hotel Vancouver presents 30 stories of relaxed urban luxury and thoughtful, experienced care. The natural charms and cosmopolitan airs of downtown Vancouver are reflected in the design of this luxury hotel’s inviting atmosphere. PAN PACIFIC VANCOUVER HOTEL (Deluxe) In the heart of the city and overlooking the magnificent waterfront, the Pan Pacific is surrounded by panoramic vistas of the harbor, mountains, Stanley Park and the city skyline. With top shopping and entertainment nearby, enjoy the best of the city in luxurious comfort. FOUR SEASONS HOTEL VANCOUVER (Downtown) Rising above Pacific Centre, Four Seasons Hotel Vancouver presents 30 stories of relaxed urban luxury and thoughtful, experienced care. The natural charms and cosmopolitan airs of downtown Vancouver are reflected in the design of this luxury hotel’s inviting atmosphere. PAN PACIFIC VANCOUVER In the heart of the city and overlooking the magnificent waterfront, the Pan Pacific is surrounded by panoramic vistas of the harbor, mountains, Stanley Park and the city skyline. With top shopping and entertainment nearby, enjoy the best of the city in luxurious comfort.